Pinecam.com • View topic - Gigantopithecus Blackii A/K/A Bigfoot In Park County ? Post subject: Re: Gigantopithecus Blackii A/K/A Bigfoot In Park County ? Flip phone? Yeah right. Ain't no track photos. Ain't on Bigfoot. I was always told that Ain't is not a word. In today's USA Today paper online, usatoday.com, under Top Stories is an aricle about a man from Wichita Falls, Tx that claims to have found a fossilized bigfoot skull near Ogden, UT. I don't know how to create a link. I don't know how long the story will,stay there but it is there now. Has a picture. Could be a rock or.....could be a skull....has ears, too. 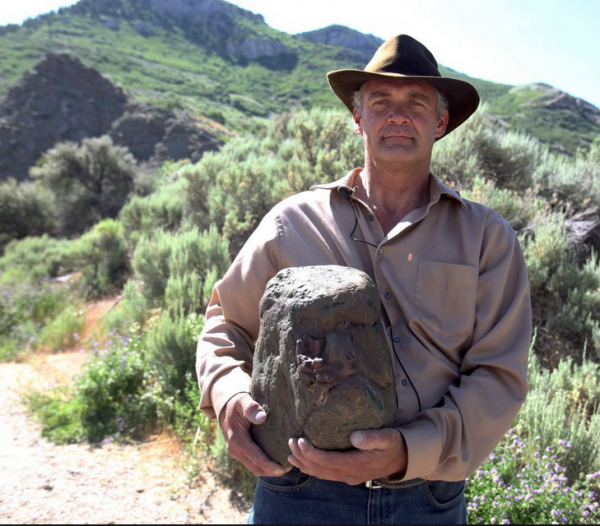 that claims to have found a fossilized bigfoot skull near Ogden, UT. I don't know how to create a link. I don't know how long the story will,stay there but it is there now. Has a picture. Could be a rock or.....could be a skull....has ears, too. If only that head looked liked Mother Teresa it could be valuable! Bigfoot came from Mars..... His proper title is Martian. A NASA image showing what appears to be a skull on the surface of Mars is truly one for The X-Files. Just noticed that there has not been any activity on here since last summer, I have been too busy to go out anywhere for a while, so have not seen any tracks since the ones on Ben Tyler Trail last year. Anyone else seen any recent activity around this area? This just in from BFRO.net...and recently, too. Saturday, April 13, 2019 1-2:30 pm at Conifer Library -- The legend of Bigfoot presented by Jim Meyers, owner of the Sasquatch Outpost in Bailey.